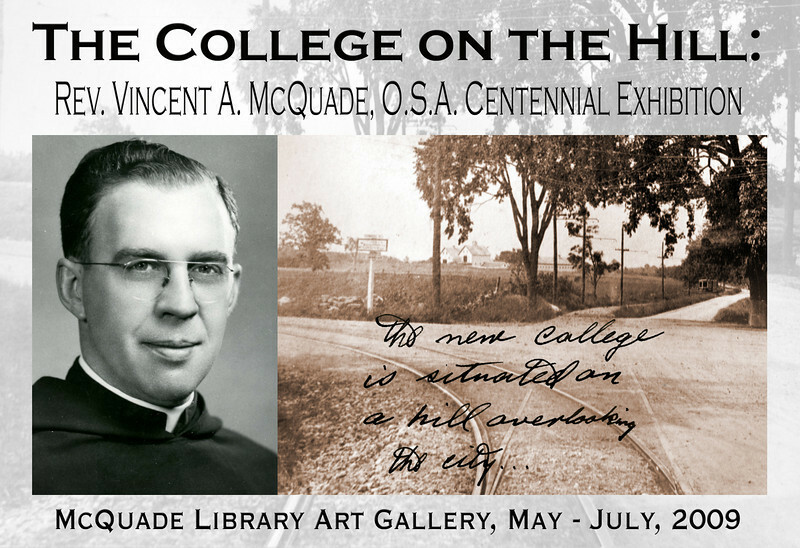 This exhibit commemorates the 100th anniversary of the birth of the Reverend Vincent A. McQuade, founder and first president of Merrimack College. 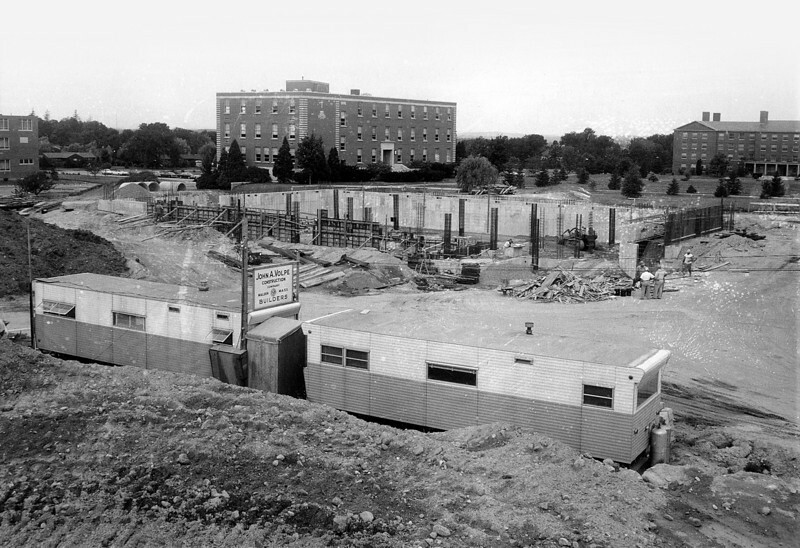 The exhibit comes nearly forty years after Father McQuade’s death and sixty–two years since he presided over the college’s opening in September, 1947. 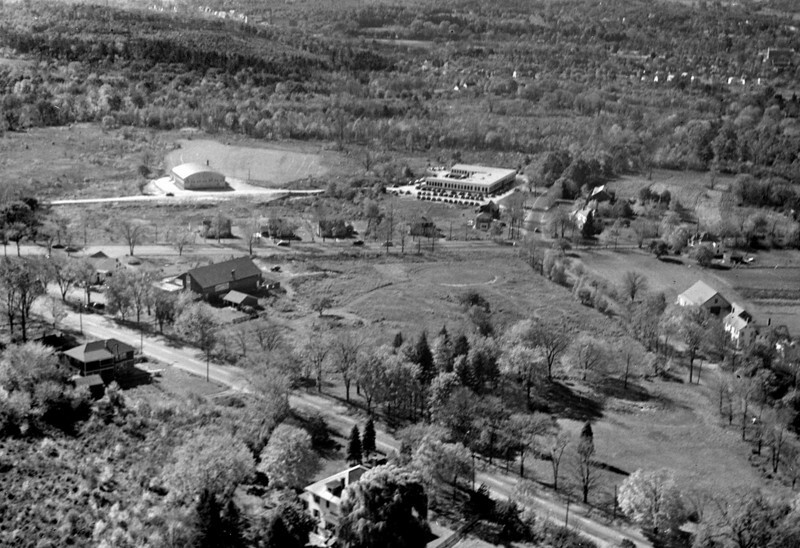 Drawn from manuscripts, photographs, texts and a rich oral history that document Merrimack’s genesis and growth, the exhibit underscores the profound significance of Father McQuade’s singular and often solitary quest to create, guide and nurture the “the college on the hill”. Future site of Merrimack College, Wilson's Corner, North Andover. Vincent Augustine McQuade was born in Lawrence, Massachusetts on June 16, 1909, the son of Owen F. and Catherine McCarthy McQuade. The product of a Catholic home, Father McQuade was a son and a brother who attended St. Mary’s Grammar School, graduating in 1922. In August the same year, at age thirteen, he was received as a Novice in the Order of Saint Augustine. 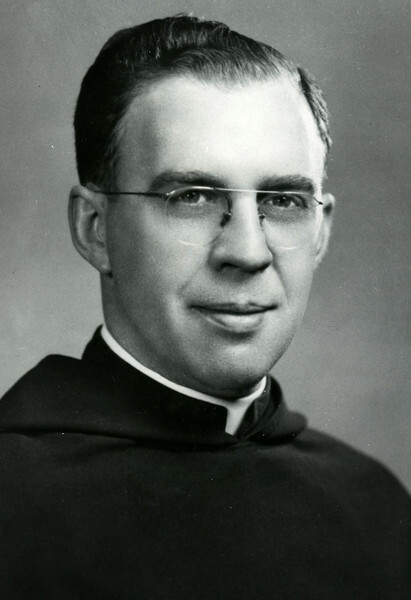 A graduate of Villanova University in Philadelphia, Father McQuade was ordained in 1934 and received his Master’s and Doctoral degrees from Catholic University in Washington, D.C.
Father McQuade was a member of the faculty at Villanova from 1938 through 1946 who served in a succession of administrative roles including Acting Dean and Assistant to the President. 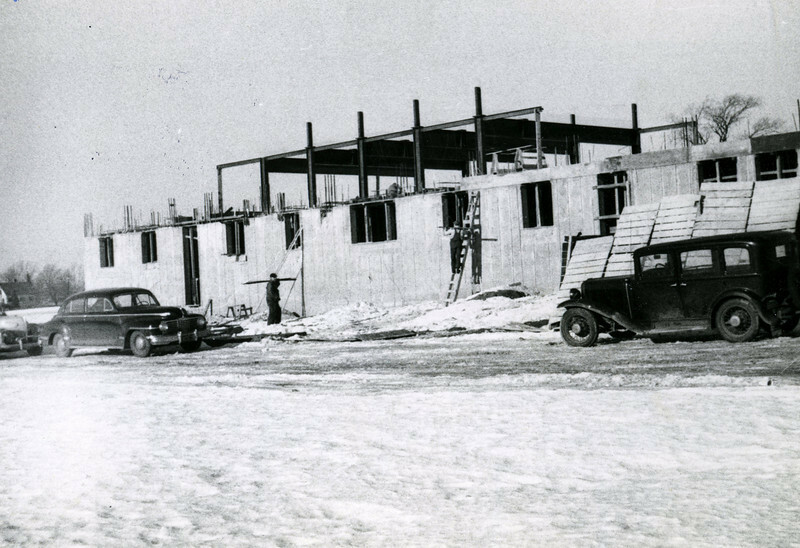 Father McQuade also held a number of positions that required him to minister and advocate for servicemen, befitting the future founder of a college conceived in part for returning veterans. 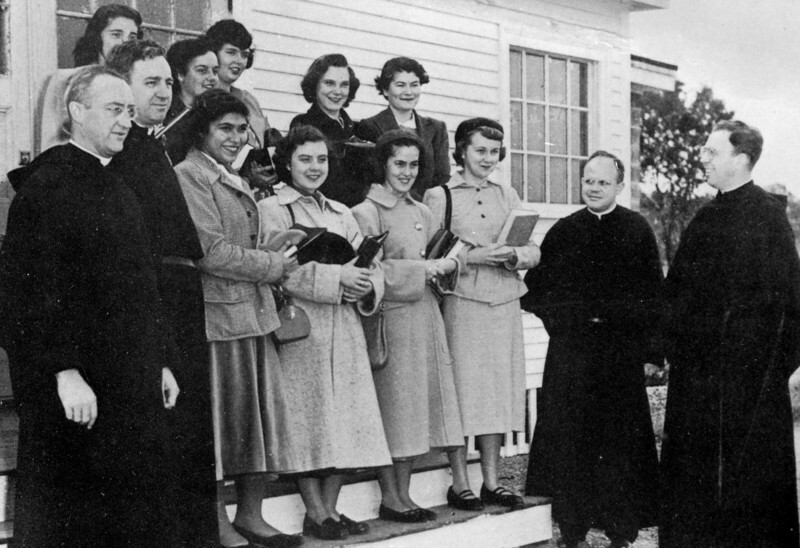 Each experience, together with the deep commitment to his faith expressed in the Augustinian values of hospitality, community and the pursuit of truth, prepared Father McQuade for the immense challenge he would take up- to establish, in many ways single –handedly, an institution of Catholic higher education in the Merrimack Valley, his first home. In Father McQuade’s lifetime, the United States endured two world wars, a great depression, a cold war with the then Soviet Union, a divisive conflict in Southeast Asia and an enormous social upheaval that characterized the decade of the 1960s. If Father McQuade was the “instrument of creation” for Merrimack, it was Archbishop Richard J. Cushing who first embraced its vision and proposed the idea to the Augustinian Fathers. 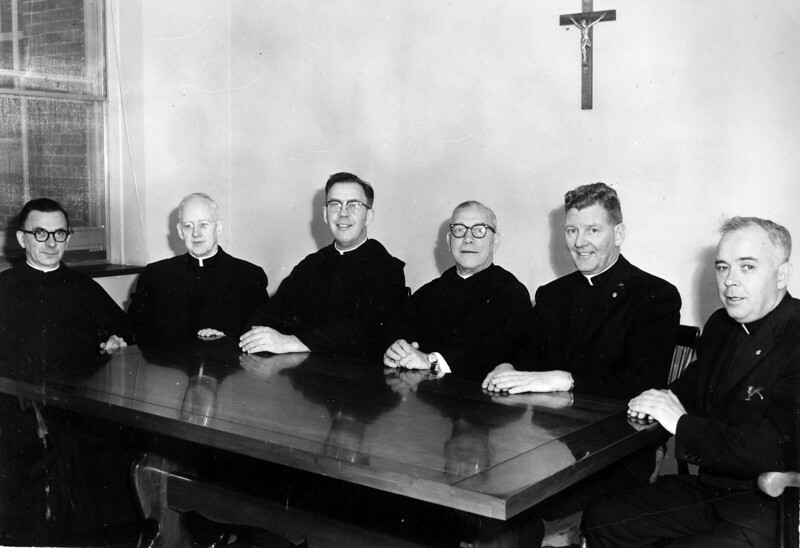 Upon Father McQuade’s return to the Merrimack Valley in 1947, one of his first official acts was to call on the Archbishop to pay his respects. It was the beginning of a personal friendship and professional partnership that would last throughout their lives. 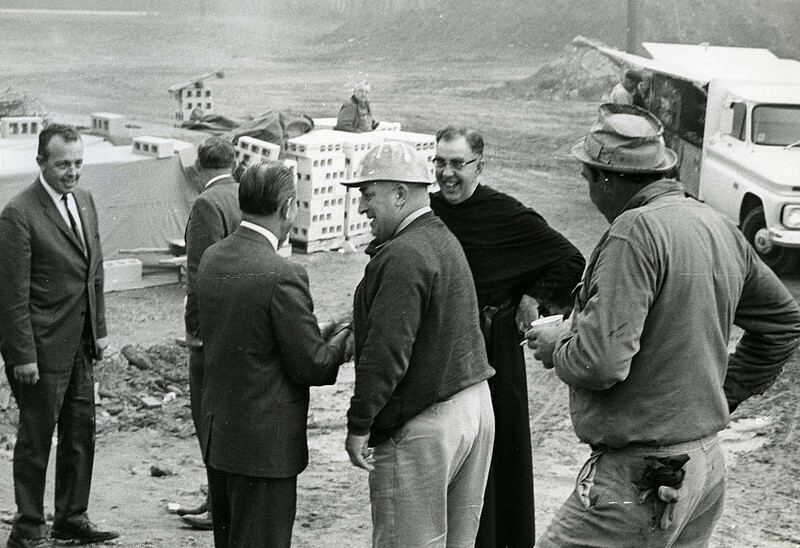 Archbishop, later Cardinal, Cushing lent critical financial support and unwavering guidance as Father McQuade worked tirelessly to make their vision a reality. Edward Roddy wrote that the natures of two men “complemented” one another: Cushing a gregarious, outspoken public figure and McQuade a serious, taciturn, shy individual. 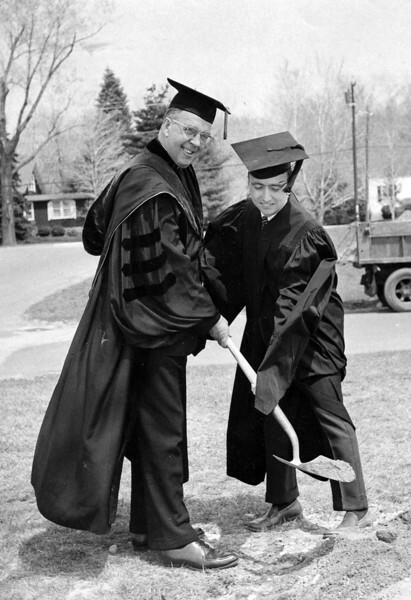 Edward G. Roddy, Jr. remarks in his book, Merrimack College: Genesis and Growth, that the decision by the Board of Trustees to name in Father McQuade’s honor the last building erected during his tenure both “fitting and proper”. 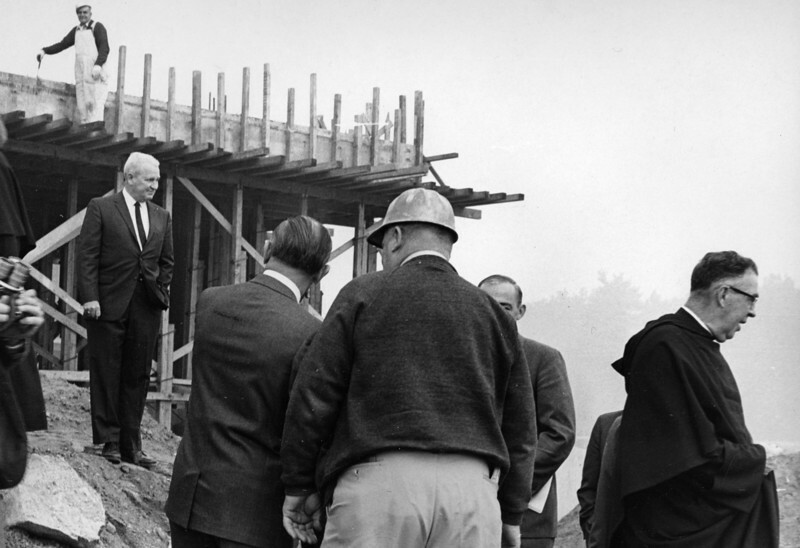 Groundbreaking ceremonies captured in the photos here were held on April 6th, 1966. 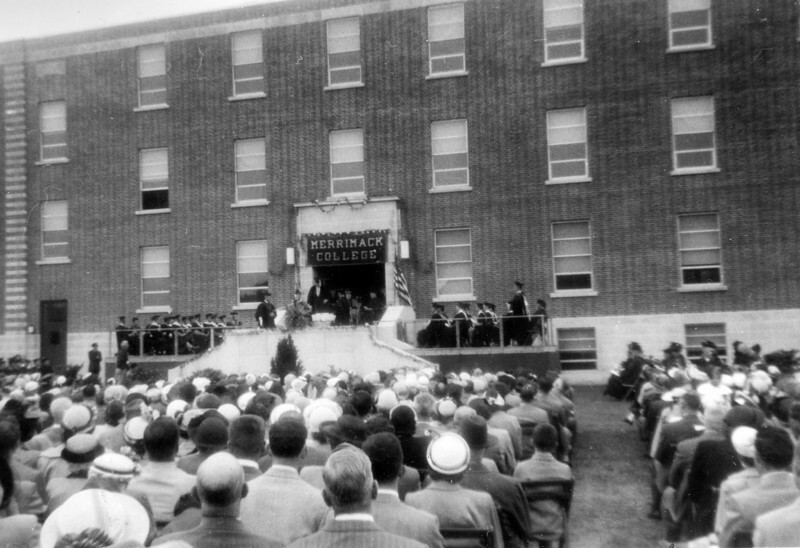 The fourteenth building to grace the college campus, the library was built at a cost of two million dollars and dedicated on April 26, 1968, nearly twenty years after Father McQuade presided over the college’s first opening ceremonies. Designed by the Boston architectural firm of Shepley, Bullfinch, Richardson and Abbott and built by the John A. Volpe Construction Company, the library was, at the time, termed an “architectural jewel” that combined form and function to produce an object of beauty. Its “imposing” and “magnificent” nature mirrored that of the man for whom it is so rightfully named. 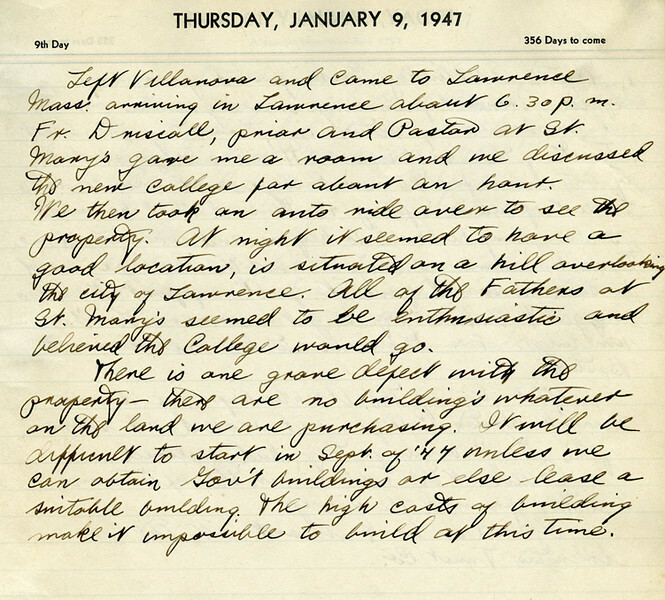 "…There is one grave defect with the property –there are no buildings whatever on the land we are purchasing. 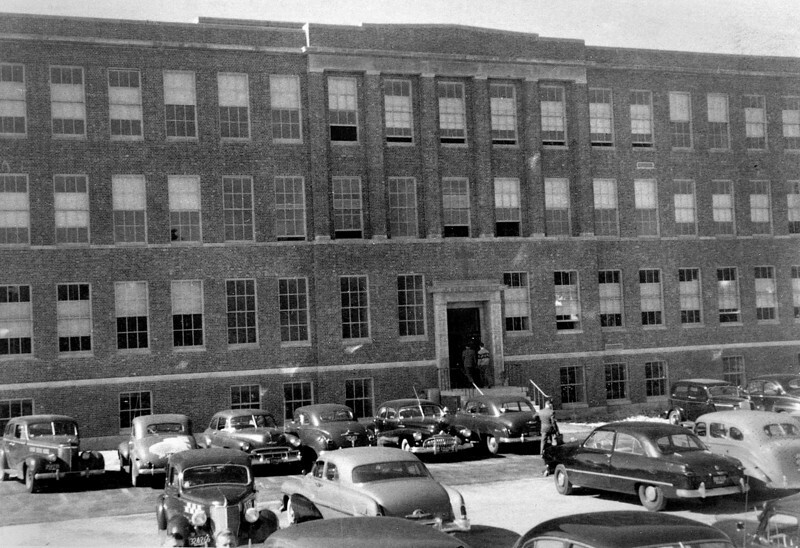 It will be difficult to start in September of 1947 unless we can obtain government buildings or else lease a suitable building. 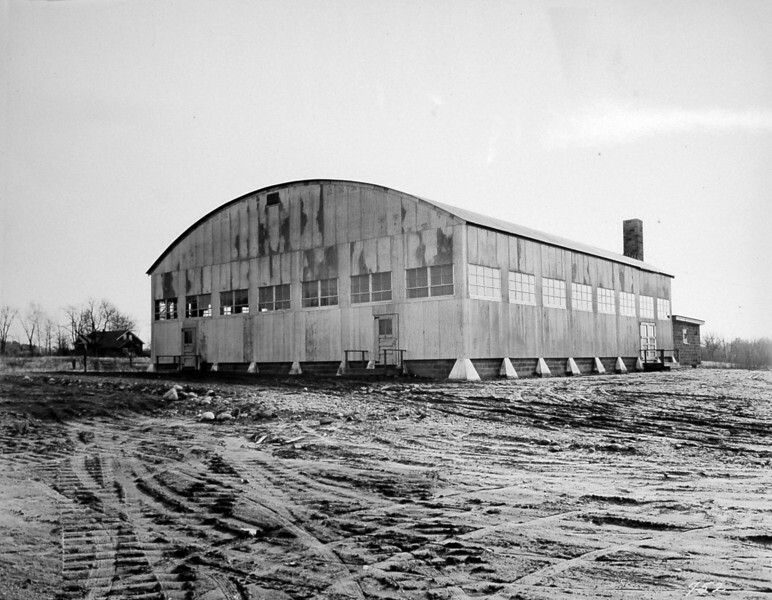 The high costs of building make it impossible to build at this time." 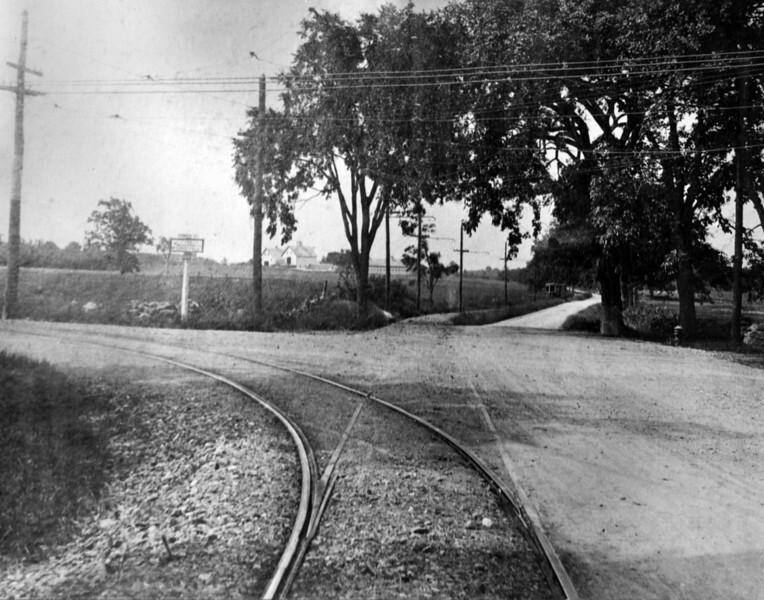 Yet in spite of great odds and numerous obstacles, within nine months, Father McQuade had overseen the purchase of land, achieved its rezoning from local authorities, secured a charter from the Commonwealth of Massachusetts, arranged for the construction of the first classroom building, drafted a course catalog and accepted applications from prospective students- all while maintaining his pastoral duties, such as celebrating daily Mass at Saint Mary’s. 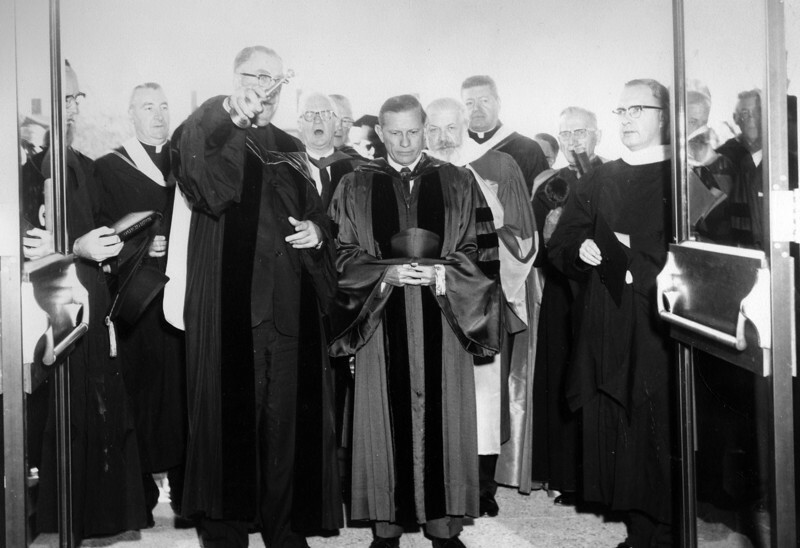 On September 22, 1947, Father McQuade presided over the College’s opening ceremonies. 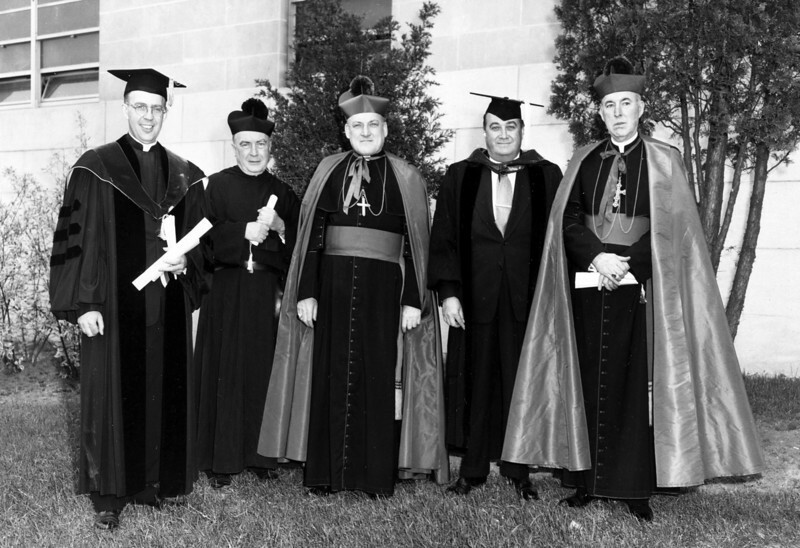 “The purpose of the Augustinian Fathers in establishing Merrimack College is to offer young men an opportunity of receiving a thorough, liberal education – an education that develops all the faculties of the soul as well as body and finds its expression in a clear thinking, right-acting Christian gentleman… Motivated by the educational traditions of the Augustinian Order, Merrimack College will constantly strive to advance the fields of human knowledge, render service to the nation and give its students a combination of scientific and humanistic learning which will fit them to take their positions in society as Christian gentleman.” Presentation by Father McQuade to the Collegiate Board of the State Department of Education, 27 March 1947. 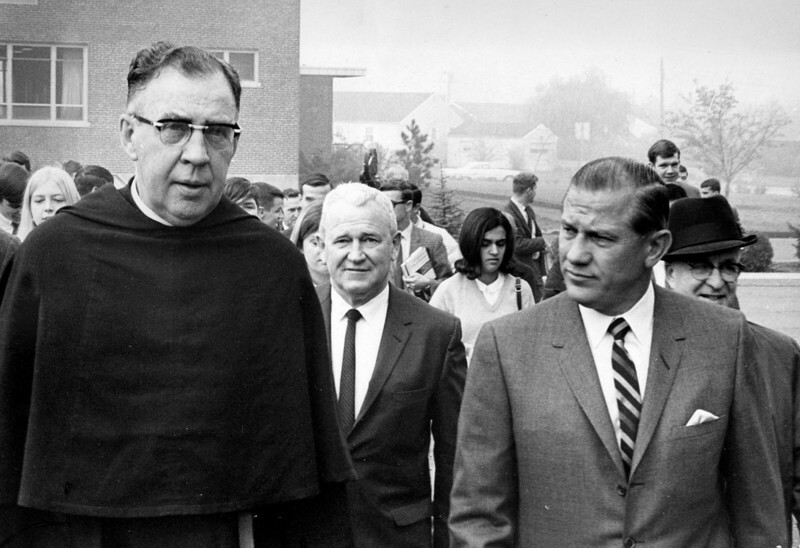 On July 15, 1968 President McQuade announced his resignation to accept the position of Provincial Treasurer of the Augustinian Province of St. Thomas at Villanova. The McQuade era, as it has come to be known at Merrimack, was coming to a close. 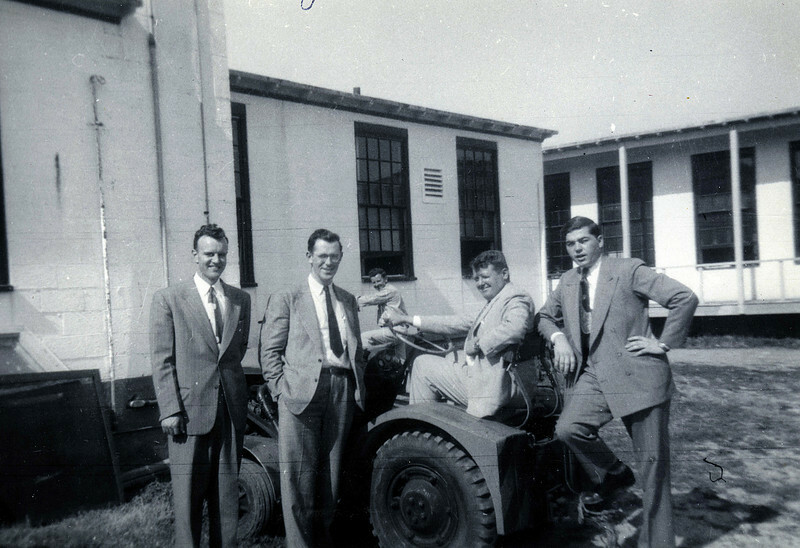 In characteristic fashion, Father McQuade left quietly and without personal fanfare though later that year he acquiesced and attended testimonials and tributes to his work and lasting legacy. 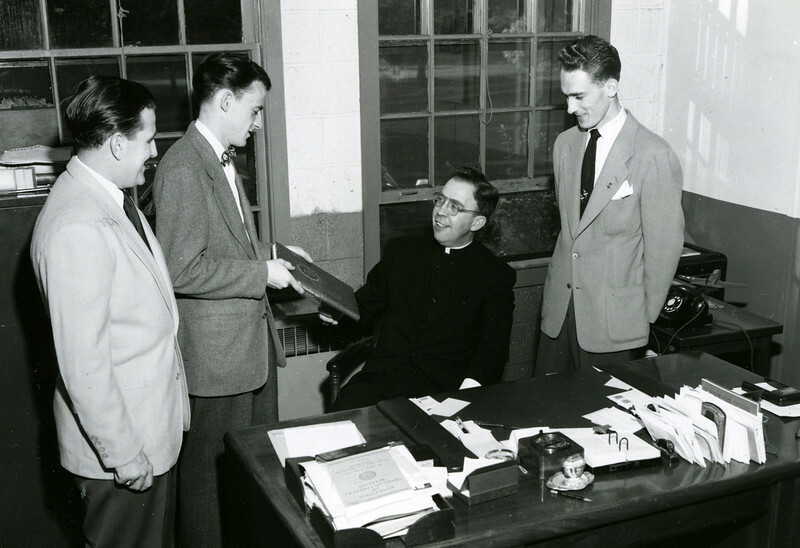 Perhaps to insure the College’s heritage expressed in its documentary history would stand on its own, Father McQuade made the decision to burn his personal papers before he left Merrimack. Taken in the context of his time and his character, this choice is not an unusual one. 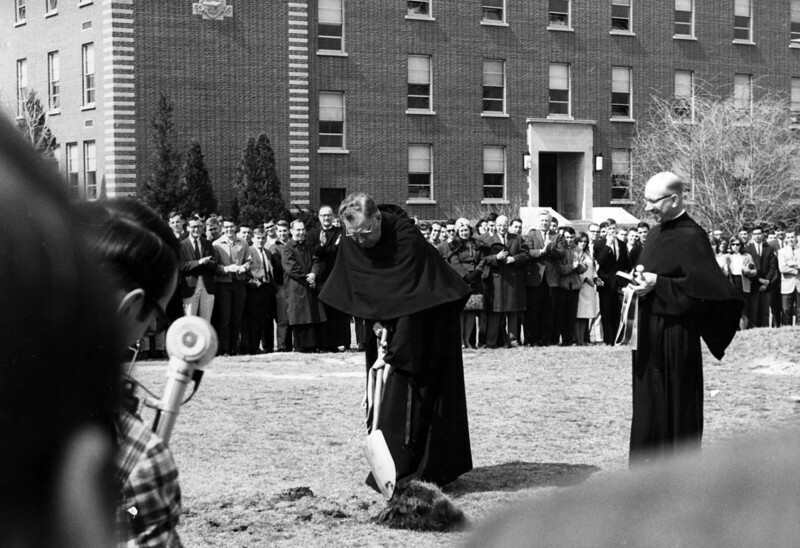 Father McQuade continued as a member of the College’s Board of Trustees until his sudden death in February, 1971. His death followed only three months after the loss of Merrimack’s other great patron, Cardinal Cushing. Father McQuade was laid to rest in the priests’ lot of St. Mary’s in Lawrence.